WARNING - To Reduce The Risk Of Fire Or Electric Shock, Read These Instructions Before Installing Your Thruwall™ TW208P Room To Room Fan. This fan is not to be installed in an outside wall. Do not use in wet or damp locations. Do not install in fire rated walls. Do not use in a window. Do not connect to a secondary remote speed control. With the use of any electrical appliance, it is important to observe all basic precautions to minimize the risk associated with use, such as electrical shock, fire, or injury to persons. If you have doubts or are unfamiliar with this type of installation work, seek the services of a qualified electrician. Suncourt assumes no responsibility for installation of the ThruWall™ Fan. For your safety and protection follow all instructions and adhere to applicable building and/or electrical codes. a) Use this unit only in the manner intended by the manufacturer. If you have questions, contact the manufacturer. b) Before servicing or cleaning unit, switch power off at service panel and lock the service disconnecting means to prevent power from being switched on accidentally. When the service disconnecting means cannot be locked, securely fasten a prominent warning device such as a tag to the service panel. c) Installation work and electrical wiring must be done by qualified person(s) in accordance with all applicable codes and standards, including fire-rated construction. d) When cutting or drilling into wall, do not damage electrical wiring and other hidden utilities. e) NEVER place a switch where it can be reached from a tub or shower. f) Prior to installation of the TW208P fan, switch power off at service panel and lock service panel to prevent power from being switched on accidentally. When the service disconnecting means cannot be locked, securely fasten a prominent warning device, such as a tag, to the service panel. Step 1. Depending on your needs, the ThruWall™ can be installed high or low on the wall. Please note that warm air rises, thus is found near the ceiling. Conversely, cold air falls and is found near the floor. The temperature of the air near the ceiling may be as much as 10°F to 15°F higher than near the floor. Start by making sure that there are NO studs, water, drain, electrical or other obstructions in the wall where you wish to install the unit. Please see the airflow direction label on the housing. Step 2. Place template flush against wall. Check for level and tape in place. Note: The wall that the template is taped to will be the fan output side. Step 3. Cut out the opening with a small drywall saw. Take care not to damage the edge of the drywall since you will be installing drywall anchors close to the hole to mount the grille. Step 4. Insert the grille with fan attached into the hole that you just cut. Make sure the fan is level and that the grille completely covers the opening. Mark the location of the 4 mounting holes. Step 5. Remove fan from hole and drill mounting holes with a sharp 3/16" drill bit. Insert wall anchors in mounting holes. Step 6. Project the edge of the round section of the cutout onto the inside of the other wall board in three places, approximately 120° apart. Use a small square or a piece of cardboard that has an exact 90° angle to mark the cutout points on the inside of the other wall. Step 7. Use a small pin or very small drill bit (1/32" or smaller) to punch or drill these three marks to the outside of the other wall. Step 8. Place the sleeve without the grille attached, against the outside of the wall and center its location using the three holes that you made. Then trace the outside of the sleeve with a pencil. Cut the circular opening with a small drywall saw. Cut inside the pencil line. Take care not to damage the edge of the drywall. You will be installing drywall anchors close to the holes to mount the grille. Step 9. Take the electrical box cover off of the molded on electrical box and install a 3/8" strain relief that is appropriate for your 120VAC power supply wire and/or conduit. Step 10. Insert your 120VAC power supply wires through the strain relief and use the providedwire nuts to connect the white (common), black (hot), and green (ground) wires from the TW208P ThruWall™ fan to the appropriate common, hot and ground wires of your incoming power wires. Step 11. Check to see that your strain relief is securely fastened and re-attach the electrical box cover. DO NOT OVERTIGHTEN! Step12. Insert the metal sleeve with grille into the cutout opening (fan output side) and screw the grille down snugly. Step13. Insert the other metal sleeve into the cutout opening (fan suction side) and snug the flange up against the wall material. Step14. Position the unattached plastic grille over the metal sleeve that was just inserted so that the logo on the center of the grille is right side up and that one of the mounting holes is in the top center. Adjust the metal sleeve so that the three U shaped cut outs in the flange match up with the mounting holes in the grille. Mark the location of all 3 wall anchors. Step 15. Drill the holes on the wall for the anchors with a sharp 3/16" drill bit. Install wall anchors and screw the grille down snugly. DO NOT OVERTIGHTEN! The ThruWall™ is equipped with a variable speed controller. There is a speed adjustment knob on the output side of the fan. Turning the switch to the right will allow you to adjust speed from low to high as you desire. Thank you for buying this Suncourt product. 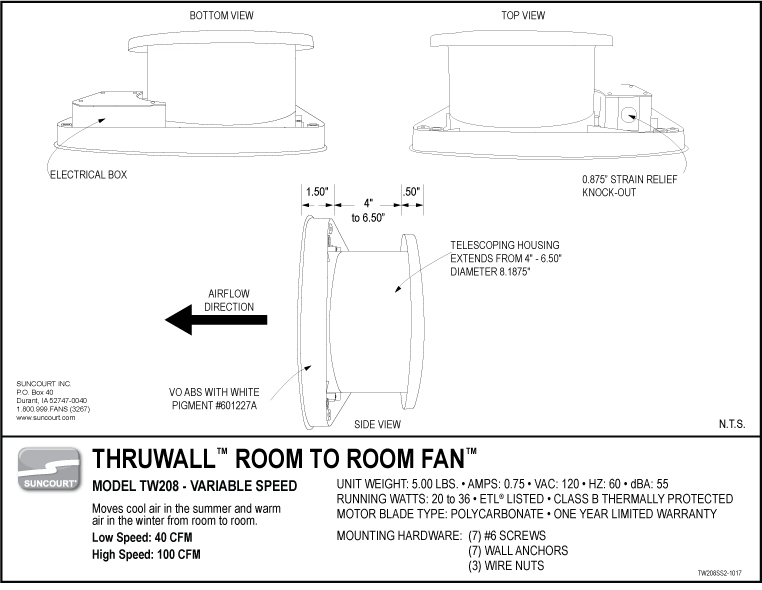 The ThruWall™ fan moves air from room to room quietly and efficiently. Simple to install in any frame wall from 4" to 6-1/2" thick. A high quality Thermally Protected motor with balanced fan blade moves up to 150 CFM. Moves heated or cooled air between rooms. Excellent for ventilation! The ThruWall™ can be mounted in any normal drywall or paneled stud construction wall up to 6-1/2" maximum total thickness. The grilles of your ThruWall™ fan may be painted to suit any decor. Thoroughly wash the grilles with mild household detergent, dry completely, and spray with a quality, fast dry, spray paint. The installation of your ThruWall™ fan is not difficult, but the cutouts must be accurate. Subject to the following limitations, Suncourt Inc. (manufacturer) warrants that the ThruWall™ Fan will, for 1 (one) year from date of original retail purchase, but not exceeding 2 (two) years from date of manufacture, remain free from appearance of defects in workmanship or materials. This warranty is subject to the following limitations: (a) manufacturer’s liability is limited to the replacement or repair of the unit, as decided by the manufacturer; (b) a defective unit must be returned, prepaid, with proof of purchase, well packaged to avoid damage in transit; and (c) this warranty does not apply to defects resulting from the alteration, abuse, accidental damage, unauthorized repair, or misuse of the unit. This warranty is given in lieu of all other warranties, guarantees, and conditions on manufacturer’s part, and the manufacturer shall have no tortious or other liability in respect to this ThruWall™ Fan. Ship unit to Suncourt Inc. only after obtaining a Return Goods Authorization (RGA) number. Returns without this RGA number will not be accepted. What’s a Suncourt® ThruWall™ Fan? Suncourt manufactures two ThruWall™ Fans also known as Room to Room Fans, Through the Wall Fans, and Transfer Fans. These quiet ThruWall Fans are mounted through the wall to transfer air from one room to another. What would I use a Through the Wall Fan for? You can use a Through the Wall Fan to equalize temperature between rooms in a variety of applications. Wood Stove, pellet stove, fireplace, or other alternative heat source owners use a Room to Room Fan to extend the effective range of their heat source to other rooms. Window air conditioner owners can likewise transfer that cool air to another room for increased efficiency with a Room to Room Fan. Homes with a new three-season room or an attached greenhouse benefit from installing a Room to Room Fan to transfer air into or out of the greenhouse or room. Mini-split users install a Room to Room Fan to increase airflow to a back bedroom or office that just doesn’t quite get enough air to stay warm in the winter and cool in the summer. Commercial users install Room to Room Fans as an accessory to PTAC (Packaged Terminal Air Conditioner) units to transfer heated or cooled air in hotel suites, assisted living or other apartments, dorms, etc. They are more efficient than using duct extender kits and much more cost effective. They also provide a much cleaner look than clunky ductwork. Which Suncourt® ThruWall™ Fan model is right for me? The Suncourt® Model TW208P ThruWall™ Fan is hard wired in the wall and features a variable speed control that will adjust the fan from low to high. It has a telescoping housing that allows it to be installed in walls 3 ¾” to 6 ½” thick. The grille can be manually rotated to direct airflow for maximum comfort. The TW208P ThruWall™ fan is ETL approved for use in both the United States and Canada. The Suncourt® Model TW108 ThruWall™ Fan features a 10’ grounded power cord and a 3-position rocker switch, which allows you to run the fan on low and/or high.It also has a telescoping housing that allows it to be installed in walls 3 ¾” to 6 ½” thick. The TW108 ThruWall™ fan is ETL approved for use in both the United States and Canada. 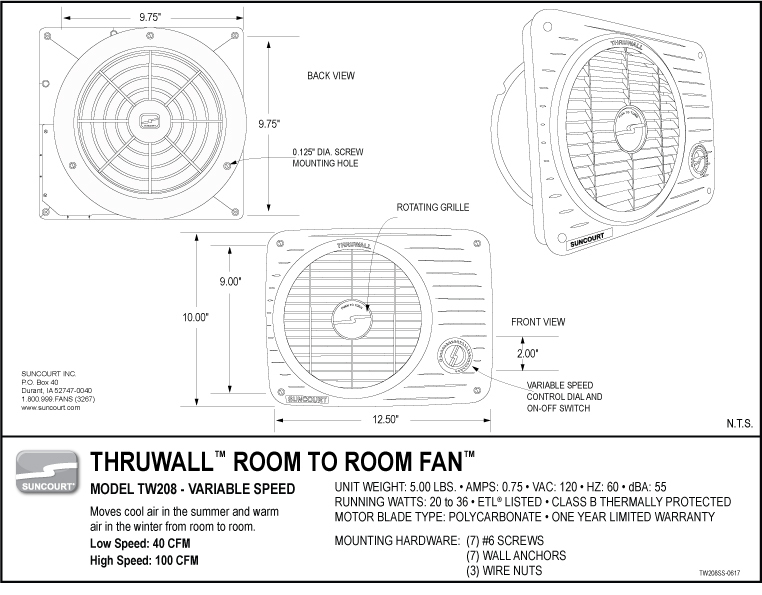 What is the difference between the two ThruWall™ fans? The ThruWall™ has a 10 foot grounded plug while the ThruWall™ Pro needs to be hardwired into the homes electricity. The ThruWall™ has a 2-speed motor while the ThruWall™ Pro has a variable speed motor. The ThruWall™ has a fixed output grille while the ThruWall™ Pro has a rotating grille that allows airflow direction to be changed. What will a ThruWall™ fan do for me? The ThruWall™ fan is designed to move significant volumes of air from one space in a building to the next. Why would I want to move air from one space to another? You may want to move heat from a central heating source to an adjacent space. Similarly, you may want to move cooled air from a window air conditioner to an adjacent space. Move heated or cooled air from one room to another if there is a great difference in temperatures between the two rooms. i.e. one room is nice and warm in the winter. The room next to it, located over an unheated space is always cold. Simply blow air from the warm to the cold room. Vent a room that always seems stuffy. Move air in or out of an All Season room. Vent a TV or family room with a smoker. Balance temperature between rooms in a hotel suite or small apartment that is heated and cooled by a PTAC. Can I reverse the direction that the air flows? No. You will determine the direction of the airflow when installing the ThruWall™. How much electricity does a ThruWall™ use? The ThruWall™ uses 85 Watts while the ThruWall™ Pro uses 55 Watts. Similar to a medium sized light bulb. How do I control fan speed? The ThruWall™ has a High - Low speed rocker switch with Center Off position. The ThruWall™ Pro has a variable speed dial. How quiet is the ThruWall™? Very quiet. The sound levels are 55dBA on high speed and 49dBA at low speed. This sound level compares to the sound of a desktop computer fan. Visit the NOISE page in this FAQ section. How do I get power to the ThruWall™? The ThruWall™ has a 10 foot long power cord with grounded plug. The ThruWall™ Pro will need to be hard-wired into the homes electricity. In what wall thickness can I install a ThruWall™? The ThruWall™ installs in any wall 4" to 6.5" thick. The two halves of the fan unit telescope to accommodate different wall thickness. Yes. Both ThruWall™ fans have been rigorously tested to the Underwriters Laboratories Inc. (UL®) standards. The through the wall portion of the housing is made of galvanized sheet metal, the grilles are high impact flame retardant ABS. The electric motor is a Class B, Thermally Protected motor.